A College of Health Scienes showcase featured UD research on babies driving robots. UD's Engineers Without Borders chapter discussed its work during a College of Engineering showcase. Alumni enjoy a presentation at the College of Ocean, Earth, and Environment showcase. Debra Hess Norris discusses saving old family photographs during a College of Arts and Sciences showcase. 12:23 p.m., June 8, 2009----The University of Delaware's Forum & Reunion Weekend provided the seven colleges, as well as other units on campus, an opportunity to highlight special programs, projects and facilities through a series of showcases held throughout the day Saturday. Most homeowners will be happy to hear the advice of UD Extension Specialist Susan Barton – stop mowing your lawn so much. Barton dispensed this and other tips at the College of Agriculture and Natural Resources showcase Saturday, which outlined the fundamentals of sustainable home landscaping. Barton says mowing just the part of your property you regularly use is one way to create a sustainable landscape, one where biodiversity thrives, where birds, animals, humans and even insects co-exist in harmony. The well-manicured lawns of suburbia represent unsustainable landscapes. Every plant has its place, wood mulch is abundant and pride is taken in blades of grass trimmed to look as pristine as a baseball field. It looks much the same from day to day. “Change is a part of the natural landscape all the time,” Barton told the group, “When you think about sustainability, it is not about resisting change but how do we adapt?” Change happens as time progresses, she said. A garden looks different by the light of the early morning sun compared to the glare of midday. Rainwater, another free item, can also benefit from a bit of good management. Rain gardens laid out in lower-lying areas with plants that thrive in wet soil, collect runoff and can look beautiful. By way of example, Barton showcased the rain garden just outside the University Visitors’ Center, where the session was held. A joint project conducted by students, faculty and staff developed a sustainable landscape around the new building, complete with placards documenting what was done and why. “Landscapes aren’t just aesthetic. They are something that feeds our soul,” she said. Cooking that soul food can require a change in mindset and a willingness to forgo your lawn looking like a grounds crew sits at the ready just behind your fence. More information and tips on creating a sustainable landscape are available online. Not using your computer at the moment? You can now donate your computer's idle time to cutting-edge biomedical research aimed at finding a cure for the Human Immunodeficiency Virus (HIV), Parkinson's, arthritis, breast cancer, and other major diseases. Through the University of Delaware's “Docking@Home” project, led by Michela Taufer, assistant professor of computer and information sciences, and supported by the National Science Foundation, more than 6,000 volunteers from around the world are donating their computer's idle time to perform scientific calculations that will aid in creating new and improved medicines to thwart some of the world's most prolific diseases. Before new drugs can be produced for laboratory testing, researchers must create molecular models and simulate their interactions to reveal possible candidates for effective drugs. This simulation is called “docking,” Taufer explained, during College of Arts and Sciences showcase on Saturday. Since the combinations of molecules and their binding orientations are infinite, simulating as many combinations as possible requires tremendous computing power, Taufer noted, and supercomputers often have a long waiting line or are too expensive to use for extended periods. Thus, researchers have turned to citizen volunteers for help, which enables them to distribute the hundreds of thousands of computing tasks across a large number of computers. The HIV-1 protease cuts the Human Immunodeficiency Virus like a scissor. If scientists could inhibit this effect, the virus could not reproduce, Taufer said. “Basically, the protein is misbehaving, and we want to find out what small molecule can correct this behavior,” she noted. Once a binding molecule called a ligand is dropped into a protein, effectively “docking,” it can switch that protein on or off, and the computer can simulate this interaction. While right now, Taufer said, the research is in the validation stage, in time, the process is aimed at studying new drugs. “We are transforming a process in nature into computer steps-an algorithm,” she explained. Volunteering your computer's idle time to do scientific calculations takes only a few simple steps highlighted on the project Web page. You install a free, open-source software program called BOINC (Berkeley Open Infrastructure for Network Computing), developed at the University of California, and link up to the Docking Server at the University of Delaware to become part of the network. Your computer's idle cycles are accessed automatically when you are not using your system. The BOINC software also is in use for such programs as IBM's World Community Grid, which focuses on diseases caused by the mis-folding of proteins, and SETI@Home, which is searching for signs of intelligent life outside Earth, Taufer said. Currently, the 6,000 volunteers worldwide who currently are involved in UD's Docking@Home project are contributing to the completion of some 30,000 docking tasks per day, Taufer said. Kevin Kreiser, a third-year graduate student in Taufer's group, is developing the software for ExSciTecH (an immersive volunteer computing system to Explore Science, Technology, and Health), which will allow volunteers to “throw” a molecule right into a protein using a Nintendo Wii. Have shoeboxes full of old photographs and don't know what to do with them? There are several steps you can take to preserve those pictures for future generations, according to experts in the Department of Art Conservation at the University of Delaware. In the “Don't Leave Grandma in the Attic” presentation Saturday, Debra Hess Norris, vice provost for graduate and professional education, Henry Francis du Pont Chair in Fine Arts, and chairperson of the Department of Art Conservation, and fellow conservator and assistant professor Jae Gutierrez shared a brief history of photography and advice for preserving heirloom photos. If you're fortunate enough to have a daguerreotype, the first type of photograph produced, take special care to protect it from humidity and handling, Gutierrez said. Named after French artist Louis Daguerre, daguerreotypes were made on a silver-coated copper plate, which gave them a mirror-like quality. They often were housed in intaglioed thermoplastic cases referred to as “Union cases” due to their popularity during the Civil War. Just like a silver tea set will tarnish in the open air, the silver coating of a daguerreotype will tarnish, Gutierrez said. But don't wipe its surface in an attempt to clean it. That's a task best left to a professional conservator. “If they're very reflective, don't apply any pressure to the surface, or you will ruin them. They're so fragile,” Gutierrez said. Contact printing was introduced in the mid-1800s when albumen (egg white) coated paper was developed. Photographers would float the paper on a solution of silver nitrate to make it light sensitive. The process produced stunningly detailed images in a brownish or purplish hue, Norris said. Then in 1890, “black-and-white” photography -- silver gelatin photography -- was introduced and became the dominant process in the 20th century until full-color photography came on the scene in the 1950s. Since both albumen and black-and-white photos can fade and yellow over time, keep them in a cool, dry room such as a closet--not in the attic or basement, Norris said. The images should be housed in acid-free paper or high-quality plastic made of polyester or polypropylene and laid flat to prevent warping. Norris noted that her parents' black-and-white wedding photographs are in better condition than her own color wedding pictures because color photography is composed of organic dyes which fade at a faster rate in the light and in the dark. Museums increasingly are pursuing cold storage to preserve color photography, an approach best left in the hands of professionals. Digital images provide a whole new preservation challenge. Gutierrez recommends assigning an external drive, a USB drive, for your image files versus CDs or DVDs on which images can be lost with a single scratch, and always printing the images that are important to you. Make sure to use pigment-based inks, which have better longevity than dye-based inks, and print on high-quality, microporous paper. For more information, the UD experts recommend the Winterthur Guide for Caring for Collections and such online resources as the National Archives, Library of Congress, and Rochester Institute of Technology's Image Permanence Institute. The University of Delaware is one of only two institutions in the United States to offer an undergraduate degree in art conservation, and one of only five institutions in the United States to offer a graduate degree in the field. The latter is a three-year master's program offered jointly with Winterthur Museum & Country Estate. Would you find a rattail fish in: a) warm Atlantic Ocean waters, b) the Dead Sea, c) a rattail fish store, or d) abyssal plains? The 35 participants in the College of Earth, Ocean, and Environment (CEOE) showcase presentation at Forum and Reunion Weekend know the answer, and through the use of new classroom technology, they got to compare their understanding of environmental topics with their fellow attendees. CEOE Assistant Dean Frank Newton led the audience through several questions, with participants using wireless calculator-sized instruments to transmit their answers to Newton's computer. All responses were tallied within seconds. Newton noted that such instantaneous feedback helps UD instructors determine whether lectures need to be adjusted. If a large percentage of students respond incorrectly to a particular question, for example, the instructor may use that feedback to revisit a particular topic. Additionally, the technology allows greater student participation in the classroom. 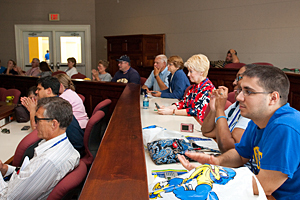 While all attendees could answer each question, Newton also recruited audience volunteers to answer in front of the class for the chance to win prizes including UD and CEOE apparel. Newton and CEOE Dean Nancy Targett also used the questions to describe some of the college's research activities and scientific resources. College faculty and students, they said, have access to a state-of-the-art research vessel, an airship and a submersible robot to help them explore Earth's ecosystems. And the rattail fish? The creature inhabits the abyssal plains of the deep ocean. In a joint effort that emphasized the interdisciplinary character of the College of Education and Public Policy, faculty and graduate students representing the Department of Fashion and Apparel Studies and the Center for Energy and Environmental Policy (CEEP) presented practical tips for conserving energy and other natural resources through our choices as consumers of clothing and household energy. Noting that up to 70 percent of the energy consumed in the life of a cotton garment comes from laundering, fashion faculty Marsha Dickson, Sharron Lennon, and Hye-Shin Kim advised the audience to purchase energy-efficient appliances, launder in cold water, and air dry clothing whenever possible. Among their energy-saving tips, graduate students Manu Mathai and Lado Kurdgelashvili of CEEP advised the participants to be aware of and minimize “phantom loads,” that is, electricity drawn by household electronic devices that remain plugged in even when they are not in use. They also provided information regarding the University's Climate Action Plan, which aims to reduce energy use and carbon dioxide emissions on campus by 20 percent by 2020. The 300 people who came out for the Blue Hen 5K on Saturday were looking for fun and exercise, but every day 3,000 people in the village of Bakang, Cameroon, depend on women and children walking that distance to fetch water. The UD chapter of Engineers Without Borders wants not only to make it easier for those villagers to get their water but also to ensure that their water is clean. Some 40 attendees turned out for the College of Engineering showcase, Water is Life, to hear about the Cameroon water project as well as a new project the chapter is undertaking to build a bridge in Guatemala that will enable crop access during the rainy season. The program, which included several video clips from the chapter's current stint in Cameroon, was presented by Dan Ruhlman, a senior mechanical engineering major; Andrew Paulus, a junior mechanical engineering student; and Catherine Collison, a junior in chemical engineering. “There are 1.1 billion people in the world without access to clean water,” Ruhlman said. “Since we can't help them all, we narrowed it down to a village of 3,000.” The project includes providing the villagers with slow sand filters as well as a solar-powered pumping system. The project has taught the students that it's essential to include the villagers in any solutions they provide, that the work is sustainable only with community buy-in, and that those who benefit from the project should pay something in order to feel a sense of responsibility and ownership. The UD-EWB chapter is currently on its fourth trip to Cameroon and will travel to Guatemala for the first time in August 2009. The group is advised by Steve Dentel, professor in the Department of Civil and Environmental Engineering. Close to 50 people turned out to see 2-year-old Andrew Peffley driving around in front of Mitchell Hall at the College of Health Sciences Showcase, hosted by Cole Galloway, associate professor in the Department of Physical Therapy. Andrew, who has spina bifida, can't walk, but a team of UD researchers is providing him with mobility through the use of a miniature power chair armed with a robotic brain that keeps him safe and empowers him to explore the world while also providing valuable data to the researchers. Galloway is collaborating with Sunil Agrawal, professor of mechanical engineering, on the project. Since then, they've found out what they can do together -- help babies like Andrew move when they want to, where they want to. 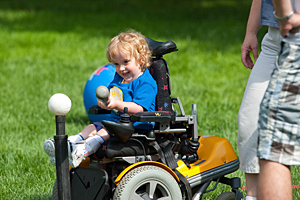 “Those abilities are integrally connected to the joys of life,” Galloway said. Alumni filed into the Lerner College of Business and Economics' Exelon Trading Center on Saturday to try their hands at playing Wall Street. Designed to replicate the trading floors in investment banks, brokerage houses and hedge funds on Wall Street, the 2,200-square-foot center contains 16 classroom workstations, as well as four research room workstations and real-time feeds to two tickers and four LCD displays. Richard Jakotowicz, a 1998 University of Delaware graduate and manager of the Exelon center, led the session along with help from Kavi Chokshi, a student in the University's Lerner College of Business and Economics. Jakotowicz talked about his experiences as a UD undergrad and told the alumni he met his wife in the room right across the hall. He then delved into why technology is so important for universities to employ for this current generation. “It's funny, I'm supposed to be the one who knows everything about technology but the students every single day teach me something in this room,” said Jakotowicz. After hearing about the center, the attending alumni were given the opportunity to get an interactive view. Each was given $2 million in pretend money and $2 million in buying power, which basically amounts to a loan, and were set loose in two simulated stock market trading sessions. A graph in the front of the classroom showed the peaks and valleys as participants bought and sold their shares at rapid speeds. By the end of the second session, though one participant made out very well, most all of the others were plunged into debt. “If we just look at the winners, we have one, two little ones, so three winners and everyone else failed miserably,” Jakotowicz joked as everyone in the room laughed. They begin by scanning transcripts, then read essays and recommendations; they try to imagine what that student would bring to campus and how he or she would shape his or her class. “It is important to understand what a human process this is,” UD Director of Admissions Lou Hirsh told the audience at Saturday's admissions showcase. Two UD alums who are now admissions counselors at the George Washington University and Columbia University joined Hirsh in the session, “Getting In: An Insider's Look at the Admissions Process.” Together they explained admission to college is not simply a numbers game. 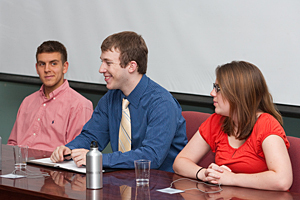 It hinges on students showcasing themselves as an interesting person. Joanna May, a 1998 UD graduate, says at Columbia, she looks for applicants who have intellectual spark. If students have parents, or other relatives, who previously attended an institution, they do have a bit of an edge. “Their essays tend to be more interesting,” said George Washington University admissions counselor Lindsay Mathers, who graduated from UD in 2004. Applicants can make themselves more interesting overall by challenging themselves inside and outside of the classroom. The panel noted it likes to see outside activities, but not just a laundry list of participation. Admissions counselors prefer fewer activities, but demonstrated investment in those activities such as leadership positions, or a noted commitment to one cause. The engaged audience asked the insiders for advice not just on getting in, but on paying for college. “Never write a school off your list because it is expensive,” said May. The panel explained schools offer a variety of financial packages and are happy to work with students and their parents; many families are even pleasantly surprised by what's offered to them. “You will probably spend a fourth of your life in retirement.” That was the message from Dan Danese, a certified financial planner, who teaches a certificate course for financial planners at UD through Professional and Continuing Studies (PCS) and who spoke at a showcase Saturday. His talk, “How Viable is My Retirement Plan -- Do I Have One?” -- was an information-packed overview of the setting of personal goals to financial options for retirees, covering lifestyle planning to pensions and Roth IRAs. There are three basic areas of planning, Danese said -- investment planning, life planning and advance planning. Life planning, what you want to do when you retire, is “hugely important and the most neglected,” he said, and leads to investment planning in terms of how much your goals and the way you wish to live cost. Advance planning involves risk management -- facing such possibilities as disability, long-term care, death of a spouse, job loss and how they can affect you. When a plan is formed, implement it and review it regularly and adjust it over time, Danese said. Danese showed charts showing the effect of inflation on the cost of living -- the purchasing power of $5,000 now will require $6,720 in 10 years and $12,135 in 30 years. “Inflation will not go away,” he said. Danese advised taking a financial inventory -- in and out cash flow, establishing net worth, figuring out “where am I, where do I need to go?” and identifying opportunities to improve net worth such as employer retirement plans and IRAs. He also discussed tax issues, involving Social Security, Individual Retirement Accounts and Roth IRAs and how to defer mandatory distribution, selling a primary residence involving income tax exclusion and other financial concerns. 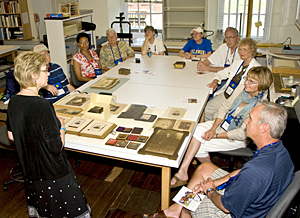 The University of Delaware Library presented a genealogy research workshop for alums interested in tracing their family roots. After a welcome from Susan Brynteson, vice provost and May Morris Director of Libraries, Rebecca Knight, associate librarian who specializes in genealogy, and alumna Fran Allmond, president of the Delaware Genealogical Society, spoke. Knight distributed informative handouts of sources and genealogy web services and reviewed where to find information at the University Library and other libraries and other sources, adding that anyone who visits the UD Library can have access to its holdings. In the past decade, there have been tremendous and amazing changes in the resources available for genealogical research, and guides are important, Knight said. One of the best is Cyndi's List of Genealogy Sites on the Internet. Another helpful book for beginners is Genealogy for the First Time, which is usually available in public libraries. She also covered searching for information in library catalogs and spoke about interlibrary loans. Allmond told of her genealogical adventures in a personal way -- there are a lot of serendipitous events and twists and turns involved in genealogical research, she said. Allmond said she always liked history, and her research into her family came about by chance when someone asked her about her ancestry at a Sons of the American Revolution dinner. It turned out one of her great grandmothers was a Talley, a long time Delaware family, and it went on from there with Allmond beginning her research and eventually becoming a member of the Daughters of the America Revolution. “What a wonderful journey it's been,” Allmond said, reading old records, hundred of files and books. She told of a chance encounter in a graveyard where she was researching the old gravestones and met women who was putting flowers on a grave. It turned out she was a distant relative, and the contact with her and her sisters provided a goldmine of information with old records and even parchment deeds, Allmond said. Tracing one's genealogy is not an easy task, Allmond said, and it is never finished, as there is always more to discover and uncover.